J'adore VIRTUAL travel in Paris... if I can't get there in real life... and of course painting it helps... enjoy your day... see you tomorrow with some NEW paintings outdoors! Ms. Fifi, my paintings arrived and they are so wonderful. More goregous in person ♥. I do believe having 3 Fifi originals makes me a collector, is that correct? :D They all put a smile on my face. Thanks a million. Our dog Heidi used to have a red lead and she was big and black, so reminded me of walking her. Never had the joy of walking her in Paris though. 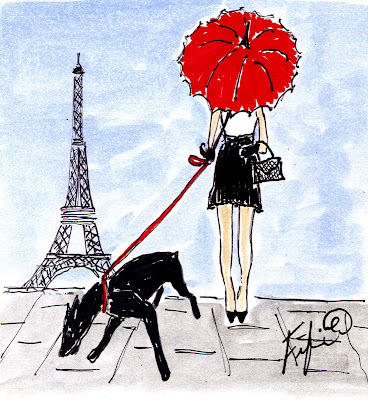 Lovely to look at... wish it were me with the dog, Paris, and the red umbrella. SIGH. Thanks for the visit and the only word to describe what happened. I love this! Very talented! PS if you need some help with blog design you know who email! I adore this drawing! That dog is almost as cute as Benjy! Very chic, chic. Love the pop of red. Such a classic! Love this painting, darling FF! Well, I just love this. The red umbrella--woo hoo! You are such a talented artist. Love this painting! Oh, this wins my heart. I loved the Eiffel tower and stayed within two blocks of it at a friend's apartment. You are so fun and talented. You just bring me smiles. love the painting and j'adore le rouge. Love the red umbrella. Yes you should do a calender. swish. See how it turns out. I am sure it won't with all those lines. Oh I have missed you...I have not visited for a while. I so love this painting...I am really starting to like red! LOVE the popping red umbrella!